As a little girl in West Bengal, India, Tiyash Parira would sit at night and watch the stars and dream of becoming an astronaut. Then when she was in seventh grade her mom got sick and the illness piqued her interest in medicine and research. But after fainting three times at the sight of blood, becoming a physician was clearly not in the stars for Parira. She would become a researcher. Tiyash Parira in the lab at Herbert Wertheim College of Medicine. Parira chose the FIU Ph.D. program in biomedical sciences at Herbert Wertheim College of Medicine (HWCOM) partly because of the opportunity to interact with medical students. 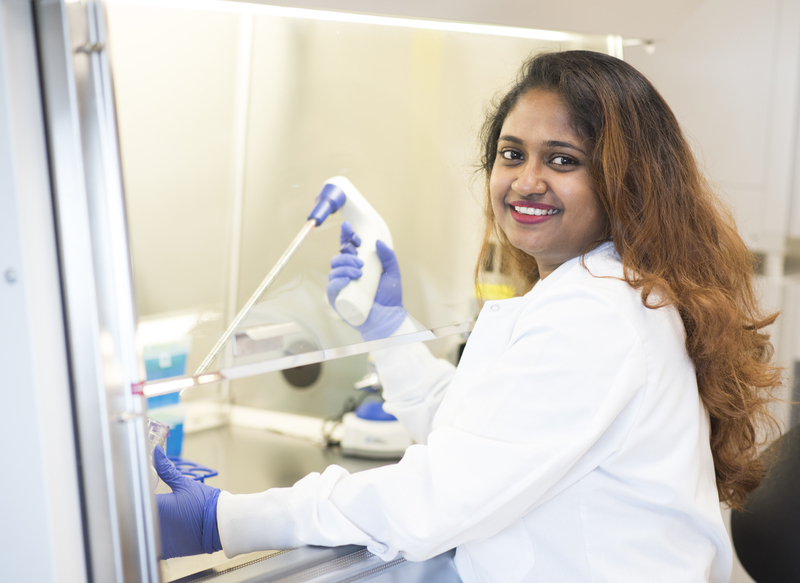 In 2014, armed with a master’s degree in biotechnology, Parira applied for and received the FIU University Graduate School (UGS) Presidential Fellowship for outstanding Ph.D.-track students. This year, she was awarded an FIU Graduate School Dissertation Year Fellowship. The 27-year-old says she is grateful for both the financial and research support she has received from FIU. “Last year I was able to publish my first authored research article in Scientific Reports,” she says. The work – a collaboration between the Department of Immunology at HWCOM and the Department of Chemistry and Biochemistry at the College of Arts, Sciences & Education – won the 2018 UGS Provost Award for Outstanding Paper or Manuscript (STEM). The paper is part of the ongoing work Parira is doing in the lab of her mentor Marisela Agudelo, where they are studying the effects of alcohol and synthetic cannabinoids on the human immune system using cutting-edge technology such as imaging flow cytometry. “Prevention is always best, but what about people already addicted?” Parira says. One day, she wants to find a cure.